The same man who teaches Shakespeare and Arthur Miller to teenage boys by day has also published not one but two debut novels about serial killers. The air in Geoffrey Girard’s homeroom smells like burnt toast. This rainy October day, the window blinds are askew and the walls are adorned, as they always are, with fantasy posters, faux shrunken heads, assorted popsicle-stick and papier-mâché sculptures, the obligatory statue of the Virgin Mary, pirate ships, dragons, and trophies. Quite comfortable in the eclectic decor, roughly 20 boys stand quietly, hands over their hearts, just long enough to recite the Pledge of Allegiance and morning prayer; on the word “Amen,” the room erupts into a model of contained chaos. One boy removes an English muffin from a toaster oven in the back of the room and squeezes butter onto it from a paper Dixie cup. Another fishes a crumpled paper out of the garbage can and smooths it out, then hands it in. Still others hover patiently near Girard’s desk at the back, clutching sketchbooks and speeches for his opinions and approval. As the day goes on, more students will filter in and out of Girard’s room at Archbishop Moeller High School, mostly for English classes. Some will bake quesadillas in the toaster oven; others will give elaborate excuses for not handing in their homework. Only once will Girard run his hands through his hair and utter an exasperated sigh; within a nanosecond he is back on task, directing students to “use your brains” and “look me in the eyes and hand me something you’re proud of” as they turn in papers. On the surface, Girard sounds like a typical boys’ high school teacher…except that he’s not. A few days prior, he was chatting up fellow authors and autographing novels at Books by the Banks. And a few weeks before that, Girard was killing it at a packed book signing at Joseph-Beth Booksellers (OK, he did offer extra credit to students for attending). There, in under half an hour, Girard not only told his life’s story (nine minutes), he also gave a brief history of cloning (seven minutes), touched on the psychology of war (one minute), answered 10 questions from the audience, and successfully mocked the Twilight books, Mary-Kate and Ashley Olsen, and even himself. “OK, breathe!” he commanded at one point. “Are we interested? Is this good?” The audience cheered and Girard pressed on. 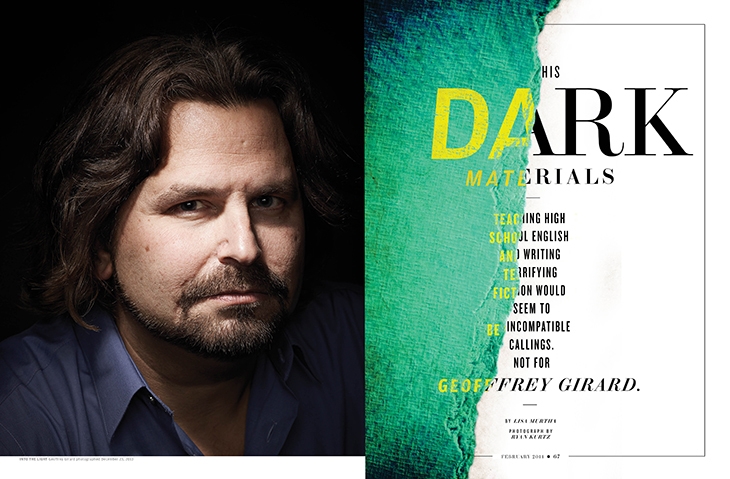 Six feet tall with an intense, blue-eyed stare, a thick mane of wavy chestnut hair that hovers between his chin and shoulders, and a neatly trimmed beard and mustache, 46-year-old Geoffrey Girard may not look the part but he is, in fact, the literary equivalent of Clark Kent and Superman. The same man who teaches Shakespeare and Arthur Miller to teenage boys by day has also published not one but two debut novels with one of the nation’s largest publishing houses. Cain’s Blood and its YA companion book Project Cain (YA is publishing slang for “young adult,” targeting readers ages 12 to 18) hit bookshelves this past September. The novels are “simultaneous versions of the same story, aimed at two different markets,” says Girard’s adult-book agent, Peter McGuigan, co-owner of Foundry Literary & Media. In both novels, a pack of teenage human science experiments—all clones of infamous, real-life serial killers (think Jeffrey Dahmer, Ted Bundy, the Boston Strangler)—have been released from captivity and are roaming the country, committing heinous crimes. The adult novel is told from multiple points of view, focusing mainly on Shawn Castillo, a former black-ops soldier who tracks, and ultimately hopes to stop, the clones; the YA version is told from the point of view of one of Jeffrey Dahmer’s teenage clones, who ends up helping Castillo. The next challenge for McGuigan and Stephen Barbara—Girard’s YA agent—was marketing both versions of the book; they wanted to try and sign them at the same time with the same publishing house, something “no one [had] ever done before,” says McGuigan. It didn’t help that reactions to the books were “not neutral,” says Barbara. “My favorite e-mail from an editor was a one-liner saying: ‘Y’all are sickos,’ followed by three exclamation points.” The agents were elated when, in the spring of 2012, Simon & Schuster scooped up both books. And where was Girard while all of this was going on? “It’s funny,” he says, pointing toward his back, “I was getting a music tattoo when the initial phone call came from Simon & Schuster. Swear to God!” It turns out that this Catholic school-teacher-slash-fantasy-writer also plays guitar and keyboards, and did so for many years in local rock bands. “I gave that up just when I started doing the Cain books,” says Girard, who also notes that he purposely bought his Jeep then, too, because it did not have enough room to store his band gear. Add up the hair, the Jeep, the band, the tattoo, the book deal, and the day job at Moeller, and you begin to understand that Girard is a study in contrasts. He is somehow refined yet coarse, literary yet rugged, dark yet light, and introverted yet outgoing all at once. And then there’s his energy, an almost tangible substance bubbling at all times just beneath the surface. He rearranges desks constantly as he lectures, erases the board with his fist when he’s in a hurry (often leaving himself covered in chalk dust), and fiddles with small objects when he talks. He can be so intense and so passionate about both his writing and his teaching that it sometimes seems as if pure electricity itself is coursing through his veins. Add to that a Dennis Miller-esque quick wit and a very “tempered” south New Jersey accent and you have a real-life character who could fit easily into one of his own books. Growing up, Girard’s father was a college professor and his mother a college-educated homemaker; he also has a sister. His self-described “middle class” New Jersey upbringing included Boy Scout campouts and spending much of his free time devouring science fiction and horror books (J.R.R. Tolkien’s The Lord of the Rings was, at age 10, his first literary love). After reading The Shining at age 13, “a horror writer was born,” he says. “I wasn’t allowed to see the movie, so I asked my mom if I could buy the novel and she foolishly said yes.” By the time he hit sixth grade, his fellow classmates were already predicting that he’d end up being a teacher and a writer. His first story, composed on a typewriter, was “about a kid who turns into Santa Claus and fights demons.” By his own account he fared well in creative writing contests in high school but by the time he headed to Washington College in Chestertown, Maryland, he had discovered that “there are better things to do in college than write short stories” (insert a coy smile here). He stopped writing for a while, he says, though he still managed to graduate with a degree in English Lit. Girard came to Cincinnati in 1991, trailing a girlfriend who’d landed a job at P&G, “with, like, $1,000 in my pocket and a car full of crap—the way you’re supposed to at 22.” Though he intended to find a teaching job, he landed a role in customer service at Cincinnati Bell instead (“A college degree English major at $6.50 an hour!”). This very ordinary-sounding job changed his life. Not only did he meet his future wife there (the P&G girlfriend moved back to the East Coast); he also met Barbara Pinzka. Even with the right foundation, Girard “was quite undisciplined in his writing” at first, Pinzka recalls. “He was like a shooting star. He had a lot of ambition and drive and ideas coming every other second, but it took him a while to focus on one idea and then bring out what was best about that idea.” She taught him the painstaking process of writing airtight copy on demand—a PR writer’s mainstay. Armed with Pinzka’s imparted knowledge, Girard left Cincinnati Bell in 1994 and spent the next nine years doing “marketing type things” at places like Great American Insurance and The National Underwriter Company. settling back into corporate life. He was in his mid-30s, and facing a massive “early mid-life crisis.” He had “a fancy title, a nice office with a big window, and people worked for me,” he says. “I was friggin miserable. I hated it.” He and his wife agreed that he should look back into teaching; within the year, he was taking classes at Xavier University to renew his teaching license. While there, Girard met Mike Moroski—“the only other long-haired, bearded guy in the class,” and at that point a teacher at Moeller. Moroski—who eventually went on to teach at Purcell Marian, then ran unsuccessfully for city council last fall—asked for Girard’s résumé and “within three weeks, I had a job at Moeller.” Once again, “the universe was in approval of my plan,” Girard says. He has taught there ever since, and was promoted to Chair of Moeller’s English Department in 2011. Almost as soon as he began teaching, Girard entered into a prolific phase of writing. Between 2005 and 2010, he published 14 stand-alone short stories (mostly science fiction and horror, including “Cain XP11”) and four books. He pitched and sold the first book, Tales of the Jersey Devil (a collection of stories about the state’s legendary monster—“it’s like a kangaroo with a horse face and wings,” he says), to a small New Jersey publishing house called Middle Atlantic Press; he went on to publish two more compilations with Middle Atlantic, followed by a retelling of The Iliad with Purun Media in 2007. By 2011, he had secured Barbara and McGuigan as agents and was busy working on the Cain books. “Some conspiracy lovers are really no fun to hang around with, but Geoffrey is a blast,” says McGuigan. Oversimplified? Perhaps, but Girard knows his audience: “You have to be able to talk their language and teach them yours,” he says. It’s a principle he’s adhered to since his student teaching days right out of college, when he witnessed a lost opportunity to connect during a discussion on The Great Gatsby. A student had an a-ha moment “comparing Julia Roberts’s character in Pretty Woman not kissing her johns to Daisy and Gatsby not holding hands,” Girard recalls, and the teacher had never seen the movie. “I mean, come on, you can’t get to a theater to see the top movie of the year?” He’s still upset about it to this day. Either way, he’s OK with that. He can afford to be. Project Cain has gone into a second printing and Cain’s Blood “is attracting foreign attention with deals notched in Germany and Turkey,” says Barbara, his agent. Girard’s still doing radio interviews for the Jersey Devil book that he published eight years ago, and sometimes he even dreams of going back to school to earn a Master’s of Fine Arts degree. And then there are all of those boys—the students who constantly seem to be lined up beside his classroom desk, looking for the guidance and approval of a teacher whom they admire. Girard credits “the Universe” with giving him clear signs, so it will be interesting to see where it leads him next. “For even the very wise,” Tolkien wrote in The Fellowship of the Ring, “cannot see all ends.” Whatever his future holds, one thing’s certain: Geoffrey Girard is not finished. He’s only taking a breath.